In the groundbreaking text, Movement System Variability, internationally known scientists synthesize the latest research in the study of variability in the human movement system and provide an in-depth, multi-disciplinary analysis for researchers in human movement sciences and related fields. Movement System Variability’s unique dynamic systems perspective in most chapters adds a new theoretical interpretation to the role of variability in movement behavior. A rich array of scientific disciplines is represented in the text to offer insights into the nature and role of variability observed at different levels of analysis. 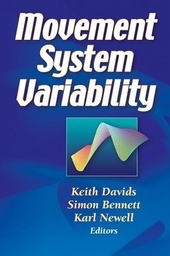 This essential reference book provides fresh insights into the nature and function of variability. Just as important, it demonstrates how an understanding of variability can enhance the practice of educators, teachers, coaches, physiotherapists, and developmental specialists. This book is an ideal reference for researchers or students interested in the human movement sciences. Chapter 1. Variability in Motor Output As Noise: A Default and Erroneous Proposition? Keith Davids, PhD, is dean of the School of Physical Education at the University of Otago in New Zealand. He has taught and conducted research in the field of motor learning and control for 25 years. In addition, he has produced three books in this area and authored numerous chapters and articles for journals. Davids has worked in higher education in both Europe and New Zealand. He is currently a co-editor of the International Journal of Sport Psychology and received a PhD in motor control from Leeds University, UK, in 1986. Simon Bennett, PhD, has taught and conducted research in the field of motor control for over 10 years. He is a senior lecturer in Motor Control at Manchester Metropolitan University, UK, where he also serves as research team leader and laboratory director. Bennett received his PhD from Manchester Metropolitan University. A few of Bennett's research interests include specificity of learning, coordination dynamics, information sources for interceptive actions, intermittent vision, ventral and dorsal processing, and observational learning. He has co-authored several chapters and articles for journals in this field. Karl Newell, PhD, is associate dean for research and graduate education in the College of Health and Human Development at Penn State University. He has conducted a long-standing research program on the role of movement variability in motor control and has helped create a new way to think about movement variability. Newell is former editor of the Journal of Motor Behavior and served as president of the North American Society for Psychology of Sport and Physical Activity.